I have really become a lover of the pressure cooker! As I mentioned before, I have always been afraid of them, but after my experience with the DVD, I have become a complete and total fan! Our family eats a lot of beans. On top of being cheap, they are so good for you! Not to mention that you can use them in so many ways. I love eating them over rice, over steamed cabbage, as a dip, in a salad, in a tortilla, in soup or as a burger (I think you get the idea). Seriously, you can make a pot of beans and eat them in a different way every night of the week and not even know that you are eating the same thing over and over again! Since I discovered the ease and simplicity of the ever scary pressure cooker, I have learned how to make them on the fly. It is so nice to decide you want beans and be able to make them within 15 minutes start to finish! These are the same foods that you used to have to prepare yourself the day before and cook for hours before you can enjoy them! I will continue to post the different beans as I try them out, but my first love is the sweet little black eyed pea. I may not be the good little southern girl that loves fried chicken, but I do love me some good 'ol black eyed peas. Combine everything in the pressure cooker. Seal and bring to pressure. Turn to medium high and maintain pressure for 9 minutes. Quick release (if you have a valve for that) or place the pot under cold water until pressure is released. Pour of the amount of liquid you don't want (there is much debate about that in this house). Salt and pepper to taste. Enjoy! Mmm, this sounds great on a cold winter's day. 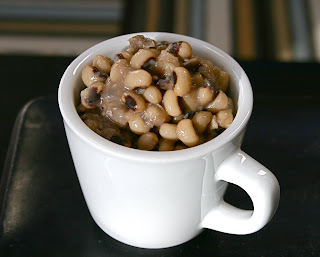 Mmm, I love black eyed peas. What a great, easy idea. I forgot to eat mine for luck on New Year's...perhaps it's not too late to eat them now! I am so glad you are finally finding use for that pressure cooker!